It was a eautiful morning.... bright blue skies, calm waters, just a light breeze. What perfect conditions to have enjoyed our last day cruising for a while. Boat traffic today was very light, for a Saturday, but it built as the day went on. The weather forecast was predicting gale force winds (over 35 knots) for offshore and inland starting Sunday night. They predicted 6 foot seas inland and 10 foot offshore - no thank you! We were happily docked in Vero in a nice protected back cove. We were visited by a couple of friends on our path today. Actually, there were LOTS of them. Here are a pair that were practically waving at us. 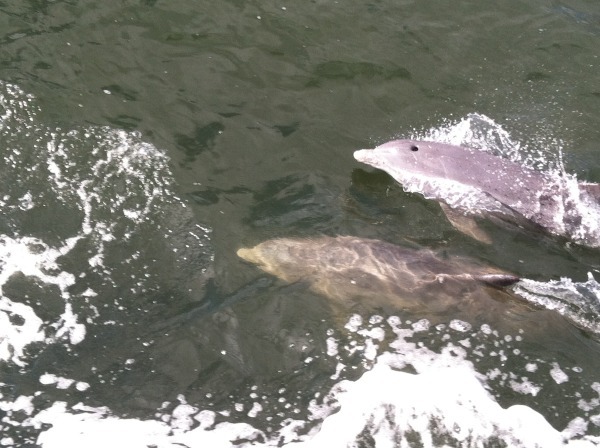 This stretch of the ICW is well known for their friendly dolphins. And, I do believe, they have a special affection for Krogens! They rode along with us for the longest time. For those of you who might not spend much time on the ICW, seeing sailboats in full, or even partial, sail is a very infrequent sight. Much of the ICW is too narrow for real sailing. They, generally, just motor along with the rest of us. So seeing so many this way is most noticable. At the end of a beautiful day, here we are coming in to Vero Beach. Thanks for the terrific picture Steve! Our plan to date is to stick around in Vero for a few weeks and explore. We have only passed through here very briefly before. This time, we plan to hang out and get to know the area. Our kids are coming in to visit us for Thanksgiving. We are so thrilled. Yes, a very traditional Thanksgiving dinner, with all the trimmings, is planned. On this beautifully equipped boat, it's a cinch. For those of you who have gotten mad at me before for "disappearing" without warning, here is your warning. Come mid- December, we are taking a break from cruising for a little while to go home and "do" the holiday thing with the family. We will be back not too long thereafter to resume this cruising life we have come to love so much. I will see you in the New Year. Today was a very short run, only a couple of hours. So, unlike our usual routine, the morning was very leisurely for a day on the waterway. We didn't leave until nearly 9am. The weather today called for intermittent showers. Indeed they were almost right, it began to rain in the first 10 minutes. It was dark and stormy. What a yucky start to the day. Not only was it drizzling this morning, we had heavy rain overnight so everything was wet, including my lines. Grrrrr! The docking lines on our boat are 1" lines (very very fat) and are incredibly heavy to throw when wet. They did not even marginally dry out in time for docking later. Though we did "beat the system" regarding rain for a few minutes. It's a good story. About 20 minutes before we were expecting to dock, it started to pour, really pour. But around us the sky was brightening so we held back a little to see what the rain would do. As we slowly approached the marina, and I was preparing lines and fenders, the rain slowed and stopped. It only stopped for about 15 minutes, but it was enough to make our chore, and the dockmaster's chore much easier. Also, thankfully, we were docked on a face dock so the torture of getting wet fat lines around a piling 20 feet away was off the table. Phew! I HATE that! Our first morning in Cocoa beach, the rain let up and it was just cloudy so we had the chance to wander around a bit. It is such a cute artsy little town. So mant cute restaurants and shops. We enjoyed 2 wonderful dinners there. One at the Black Tulip our first night, trudging through the pouring rain, and another with some friends (John and Paulette on Seamantha) at the Cafe Margaux the second night. What a wonderful visit and dinner we had with them. Thank you Cocoa Beach, we had a lovely visit. 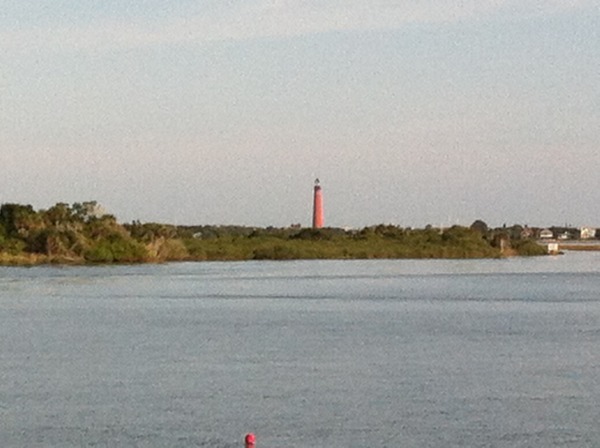 We passed the infamous Ponce de Leon inlet channel where we ran aground last year. Fortunately, it had been recently dredged so there was an easy 12 feet of water. aaaah. As the day progressed, however, clouds started to take over our perfect day. As we arrived at our dock just in time to rush in and see the launch, all we could see was a single flash of light between 2 clouds. If you blinked, you would have missed it entirely. No way could any of us have taken a picture. We did, however, hear it! Boy, the rumble was incredible. I'm not sure how far we were but maybe 15 or 20 miles max as the crow flies. It was quite a sensation. What they launched was the "Maven" orbiter to Mars. For more information, check the NASA page. So, Titusville.....not so much in Titusville.... but, as I mentioned, the Kennedy Space Center (at Cape Canaveral) is only about 30 minutes by car, so that is what we did. The enterprise dealer was very close and very accomodating. We took in a good portion of the general admission exhibits and then took off on a more subject intensive guided bus tour. The tour we chose was the "VAB", aka Vehicle Assembly Building. The tour lasted a good 3 hours so it included considerably more than just the one building. They drove us around some of the vast property and schooled us on various other buildings, launch sites and vehicle based particulars. Here we saw an exhibit of the actual retired Space Shuttle Atlantis. It was really incredible to see up close. Here they had it kind of sliced open so you could see the payload area where they stored all the things they transported to the International Space Station. This is a picture of the "VAB" from a distance on the bus. I couldn't get a closer picture because we were very restricted as to where we could walk and no way could I get the entire building in one shot from that close.